This beautiful leafy green colored box contains 5.3 ounces of high quality Ten Ren Pi Lo Chun Green Tea. 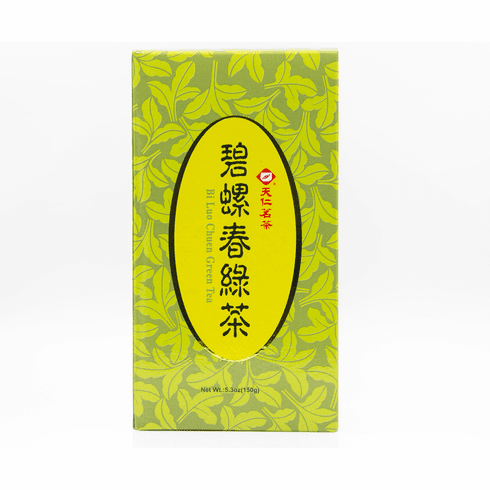 This tea comes from the Suzhou province in China, and is produced in limited quantities because of the young and tender leaves which must be used. The water used to steep this tea should be about 175-195�F or 80-90�C. Use about 0.1 ounces (3 grams) of tea leaves for about every 5 ounces (150 ml) of water. A steeping time of about 2-3 minutes with more or less time is recommended depending on desired concentration. As a rough guide, the higher the temperature of the water or the greater the amount of leaves used, the shorter the steeping time should be. To enjoy the tea leaves falling like snowflakes, fill a clear glass or ceramic cup with hot water and then add the Pi Lo Chun tea leaves. Net tea weight is 5.3 ounces (150 g) and shipping weight is 0.80 lb.